Back in the day, when people listened to music on a Walkman or had to sit in front of a TV to catch their favorite show, the only way to file your tax return was to mail it to the IRS. Then technology took over and we became accustomed to e-filing our tax returns. But wait, what do you do when you have an old tax return or the IRS has shut down e-file? Well, you must mail it in my friend! Shown below are the addresses where you can send your old tax return once you’ve finished preparing it. Note that you must send it to a different IRS Service Center depending on 1) if you are sending them money or not and 2) where you live. While the chart is pretty accurate, note that the IRS is always changing things. 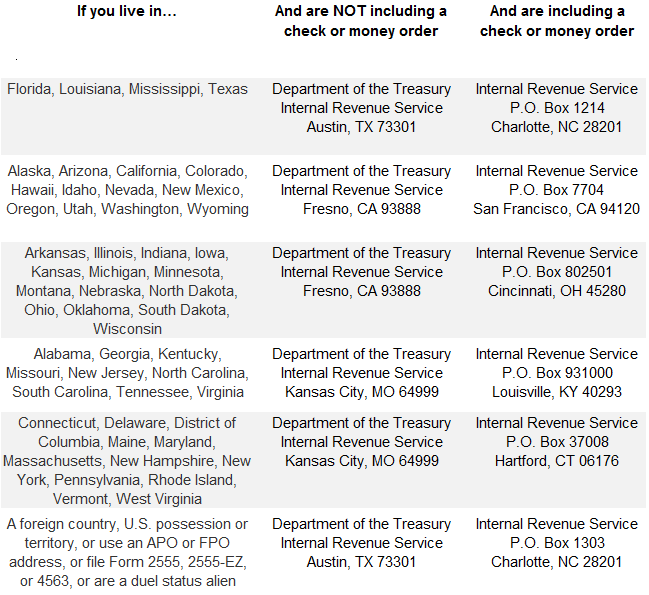 As such, we advise you to check this handy map on the IRS site prior to sending in your return. You can also find the mailing addresses on the last few pages of Publication 17.